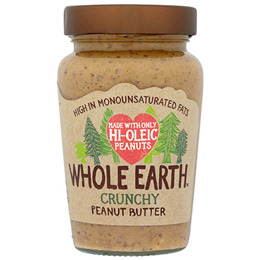 High in monosaturated fats, this crunchy peanut butter is made with only hi-oleic peanuts and all natural ingredients. An excellent source of protein and fibre. Delicious on toast, crackers or added to cakes and bakes. Roasted hi-oleic peanuts (97%), sustainable palm oil*, sea salt. *Whole Earth are 100% certified by RSPO to buy and use sustainable palm oil. This means the farming of palm oil is bound by strict guidelines to ensure the local environment and habits are preserved and communities can enjoy a better standard of living. Delicious on toast, crackers or added to cakes and bakes. Once opened, store in a cool, dry place and eat by the best before date. Below are reviews of Whole Earth Crunchy Peanut Butter - Hi-Oleic - 340g by bodykind customers. If you have tried this product we'd love to hear what you think so please leave a review. I am glad I can buy my delicious Hi-Oleic Peanut Butter from Bodykind as my local stores no longer sell this product. Thank goodness I can depend on Bodykind for my favourite health products!